Our product range includes a wide range of gear pumps. We are amongst the leading suppliers and exporters of Gear Pumps which are manufactured using superior quality cast iron and stainless steel. 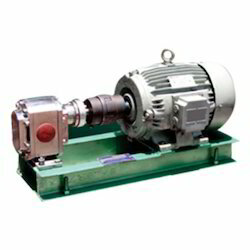 These pumps are made available in two variants which includes helical and spur pumps. These pumps produce less noise and comprise of partially and fully jacketed casing. These have a sturdy construction and are compact in size. Our products are widely used in various industries. These products are highly efficient for pumping any type of viscous liquid from light oil to thickest of molasses. Looking for EXTERNAL GEAR PUMP ?